Slow carb, no carb, carb cycles and planned carbohydrate re-feeds. What’s right for you? Low carb is certainly nothing new and recently there has been an entirely new wave of low carb curtailers that have given the nix to carbohydrates. Ketogenic and high-fat diets are dominating the dietary domain of high-performance athletes and weekend warriors alike. The premise is that fat is a preferred form of fuel for your body and even more exciting, there are these little gems called ketones that your body is ready and excited to use as a primary fuel. Using up all of that extra tummy fat for energy sure sounds a lot more appealing than using the pancake breakfast sticking to the lining of your gut from the weekend. The low-carb lifestyle promises to short cut, “Burning that off,” and encourage your body to reach into the stubborn reserves of fluff around your waist. Maybe you’ve tried the low carb thing before and perhaps all was successful. If you’re like me though, great new weight-loss endeavors don’t always go according to plan and going low carb is no exception. Low carb starts out like a great idea for many, but it soon comes to an abrupt halt when cravings and hammering stomach pangs take over. A recent article posted on Medical News Today presents evidence that hunger may be a stronger motivator than fear itself. A lot of people make the move to low-carb for a variety of reasons but not many do it right. What about you? Are you doing low carb the right way? Or are you fighting with ravenous cravings, dietary failures, and mood swings? This article will introduce you to a few low-carb basics that can help any prospective carbohydrate curtailer cut out those inflammatory and insulin boosting buggers. Here we will discuss the importance of vegetables, healthy fats and living lean when it comes to long-term, low-carb success. If you remove the carbs from your life without replacing them with something else, you’ll be miserable and you may find that the scale just won’t budge. Restrictive diets live up to their namesake by causing restriction and that’s why diets don’t last. When you remove or restrict yourself from a particular nutrient you must find a suitable replacement and one of those nutritious replacements are vegetables! You are what you eat…usually. Eating fat doesn’t necessarily mean you’ll be fat. Here’s something to remember: fats are flavor and fats keep you full. Healthy fats are the driving force behind many of your bodies’ fat burning processes and they also curb a lot of those cravings you can’t ignore. Remember that craving can be more influential than fear and healthy fats will help keep them under control. This may come as earth-shattering news to you, but you don’t need to eat until you can’t eat anymore, and you don’t need to finish everything on your plate. Eating low-carb for the long-term is all about learning to live lean. Living lean means you don’t eat until you’re about to burst. 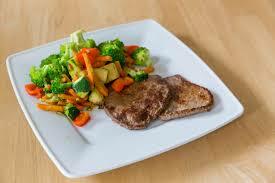 Make it a habit to stop eating when the tank is about 70% full even if there are still some remnants on your plate. Healthline. http://www.healthline.com/health/type-2-diabetes/facts-ketones#Overview1. Retrieved on 10/8/16. Medical News Today. http://www.medicalnewstoday.com/articles/313178.php. Retrieved on 10/8/16. This entry was posted in Cooking, Food, Health Tips, Healthy Eating and tagged calories, Carbs, diet, Fat, Health, Healthy, Lifestyle, Low carb. Bookmark the permalink.